Sony Pictures Post Production Services is proud of its ability to accommodate the unique preferences of individual filmmakers. We offer flexible workflows within sound editorial suites, design suites and traditional mixing platforms, along with many combinations of workflows to suit the needs of filmmakers. Our versatile, award-winning talent can tailor these environments to fit project-specific requirements and help bring each filmmaker’s distinctive vision to the screen. Our facility houses sixty sound editorial suites and four design suites/stages. For general information, contact Kimberly Jimenez at 310-244-3578. For Sound Editorial, contact Diana Rogers (for Features projects) or Kevin Wahrman (for Television projects) at 310-244-7379. 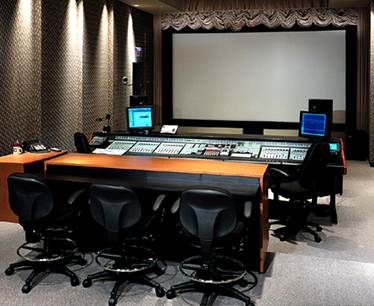 Sony Pictures Post Production Services' Sound Editorial department maintains an extensive and ever-expanding sound library. In addition to offering the latest commercial libraries, we have a large collection of original sound effects, built over many years and countless hit movies and television series. Sound Editorial is dedicated to providing quality solutions in an efficient and user-friendly manner. Our large, fast and highly secure servers allow our SFX asset management software easy search and retrieval of elements as well as server-direct editing.